Pininyahang Manok is a superb chicken dish that has been past down from generations to generations. This dish is rich, creamy, decadent and has an umami taste. There are two types of Pininyahang Manok Recipe. Heat oil in a pan, cook the carrots, potatoes for up to 3 minutes or until edges are slightly browned. Remove from oil and set aside. In the same oil, saute onions and garlic until softened. Add chicken, and stir until lightly browned. Lower heat and add the fish sauce and pineapple chunks. Stir then cover and simmer until chicken is tender (chicken will release its own juices). Add back the pre-cooked carrots and potatoes and also the bell peppers. Pour in the cream and stir. Season with pepper to taste. Continue to simmer for about 5 minutes or until sauce is slightly thickened. Serve with Rice and with Cold Drinks. 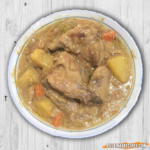 This video shows another way of preparing pininyahang manok.